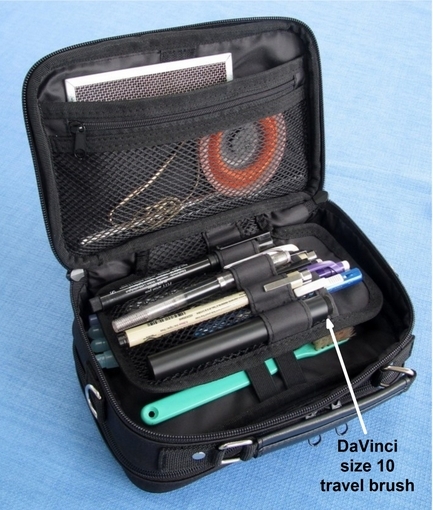 and the large size 10 fits in the loops that are designed to hold pens and pencils. There are plenty of places to stash supplies. I haven't even begun to test the maximum capacity of this kit. 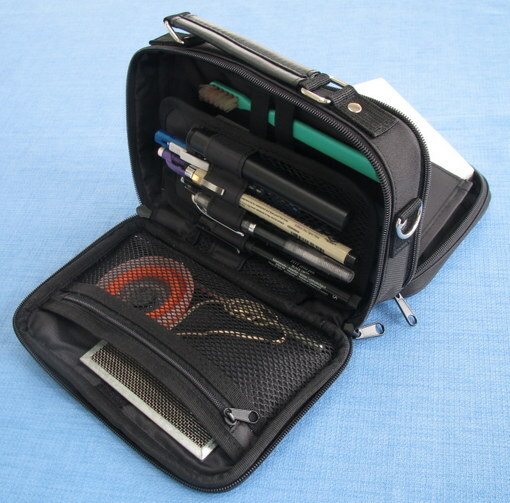 There's a handy zippered mesh pocket and a slip-in pocket behind it to hold larger items like my favorite spatter screen. 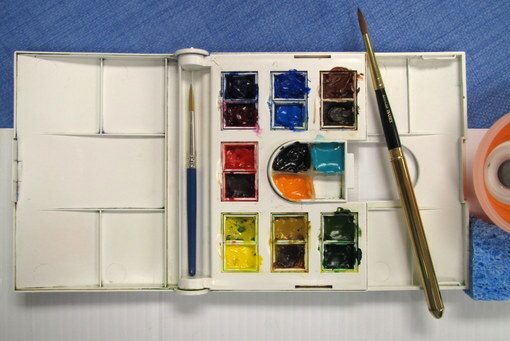 My water brushes, a ruler, and an old toothbrush (for spattering) are held in place by an elastic band. 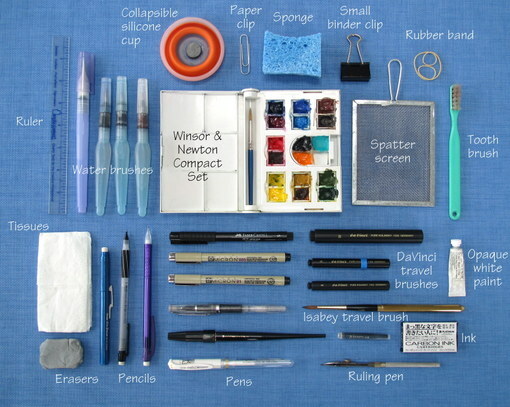 There's more than enough room for all of my basic travel sketching supplies. 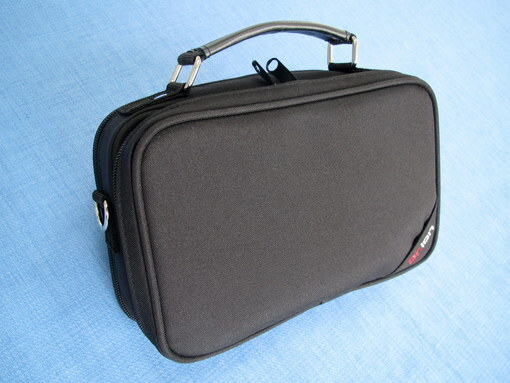 I always carry a backpack when I go out sketching, and this Dr. Ion case won't take up much room in it, leaving plenty of space for my sketchbook, portable stool, jacket and purse. 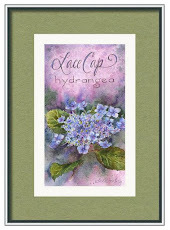 If I want to take along any other art supplies, like a natural sponge or masking fluid, which I only use occasionally, I'll stash them in one of the outside pockets of my pack. 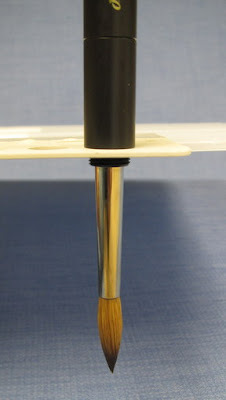 If I want the option of using regular paint brushes, rather than the travel brushes or water brushes, I can carry them in a tube brush carrier or in a folding case. I'm looking forward to taking this kit along on my upcoming trip to Tuscany where I'll be teaching a week-long workshop at Fattoria Bacio in Certaldo, just south of Florence. 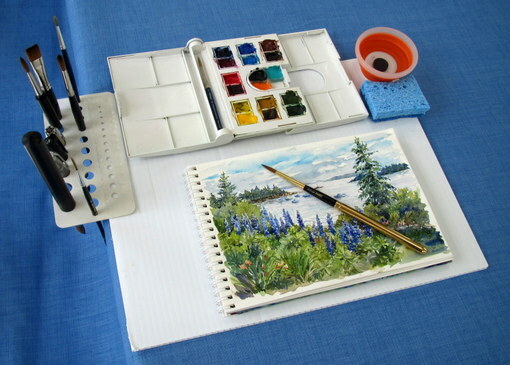 I'll be using the sketching setup shown in this post, and I promise to report back after the trip to let you know how well everything worked in the field. The Coroplast worked well, but I didn't care for the binder clips that Marc uses to hold his palette and brushes to the board, so I came up with a more streamlined approach that eliminates the need for bulky clips. It's lightweight, compact, and beautifully simple! 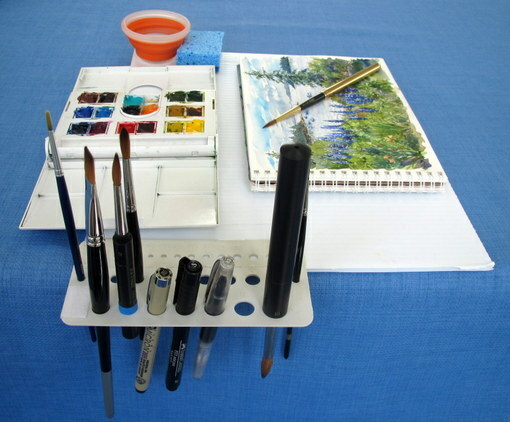 My Coroplast board measures 11" x 14"
With my setup, the palette is fastened to the board with Velcro, and the brushes and pens have their own holder with openings of varying sizes. (Surprise! It's a drill bit gauge, available for a few dollars at any hardware store.) Isn't that cool? The brush holder is taped to the Coroplast lap desk with clear Gorilla Tape, which is v-e-r-y sticky and tenacious. Believe me, this brush holder isn't going anywhere! 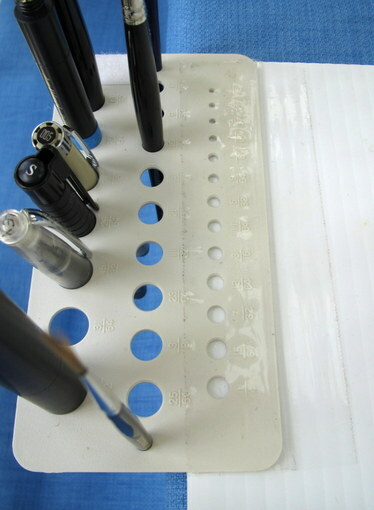 There are plenty of openings in the brush holder for the drawing and painting tools I tend to use, but if I decide I need an additional hole or two of a particular size, it would be a simple matter to drill a few more holes. See the little piece of loop Velcro in the upper left corner of the plastic? 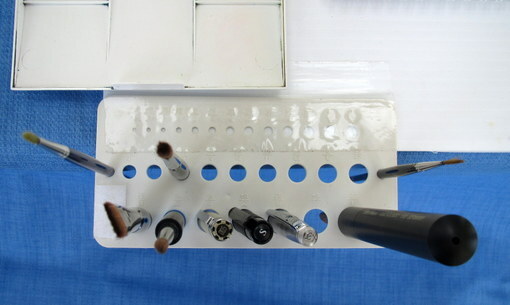 When the brush holder is folded over, it connects to a piece of hook Velcro on the Coroplast base, securing it firmly so I can slide the board into my backpack without the brush holder catching on anything. 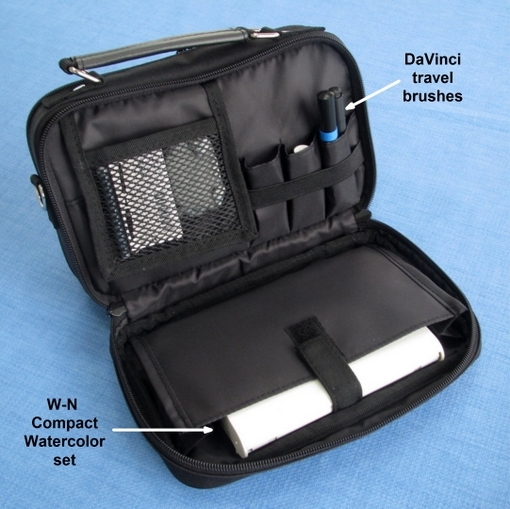 My Winsor and Newton Compact Set is the perfect size for plein air and travel sketching. 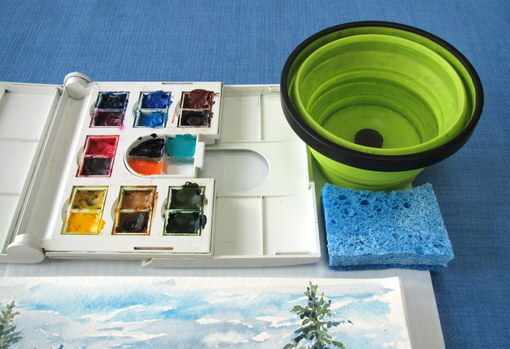 It has two mixing areas and fourteen wells, which I refill with artist's quality tube paints. I even divided up the tiny removable water cup into four sections using a bead of hot glue, giving me four more paint wells. I like having a good selection of colors. 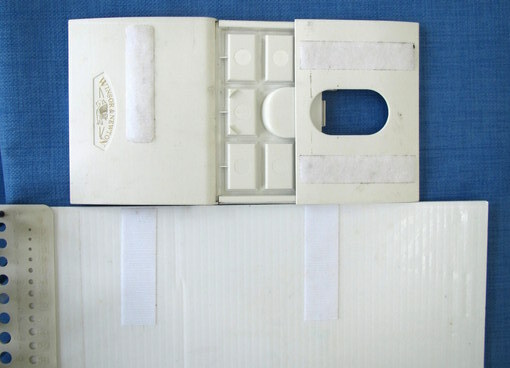 On the Coroplast, I placed strips of self-adhesive hook Velcro where it would match up with the strips on the palette. 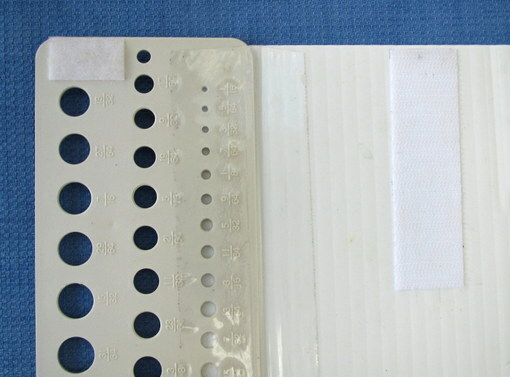 When married together, the Velcro strips hold the palette securely in place on the plastic board. 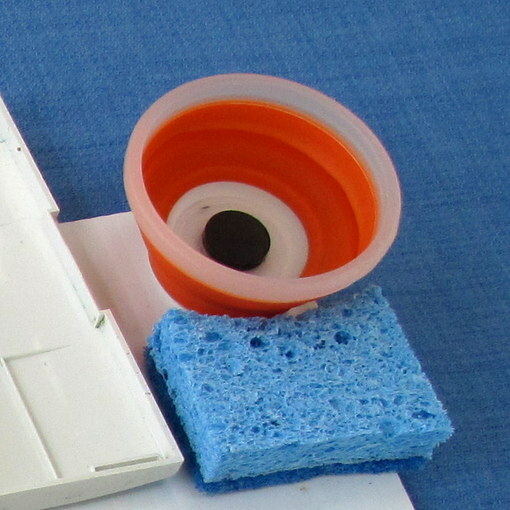 A sponge works well to absorb excess water from my brush when I'm painting. 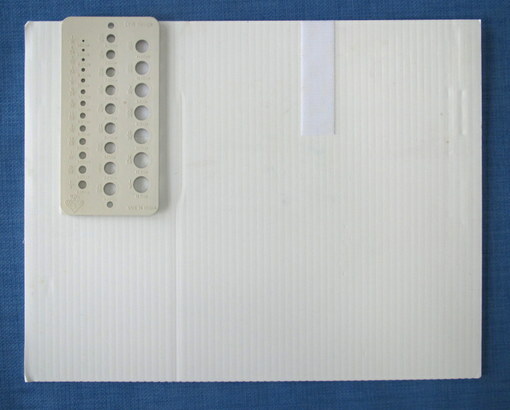 This one has a "scrubby" side, and I can slip a large paper clip between the cellulose layer and scrubbing layer to fasten the sponge to the board. It's low-tech but it works! For a water container, I like to use a collapsible silcone cup since it takes up minimal space in my bag. This small one was part of a measuring-cup set that I cut the handles off of. It holds 1/3 cup of water. A magnet is taped to the underside of the Coroplast below where the cup sits. I used Krazy Glue to attach a magnet inside the silicone cup. I'm not sure if the glue will hold over time - we'll see. 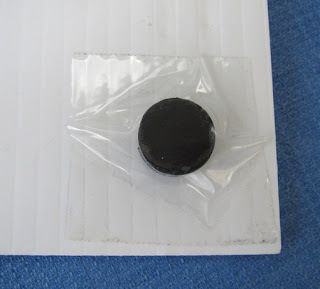 Another option is to use a loose magnet that you just drop into whatever cup you want to use. Just be sure you don't lose it when you empty your water. This whole setup is compact, efficient, streamlined, and user-friendly. I'll be taking it to Italy with me in October, and I'll let you know if I come up with any improvements after a couple of weeks of use in the field. It seems pretty perfect now. 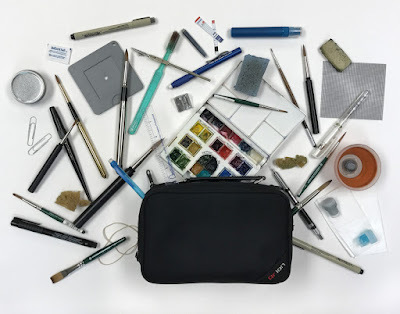 Wondering what to carry your palette, pens, pencils, and brushes in? 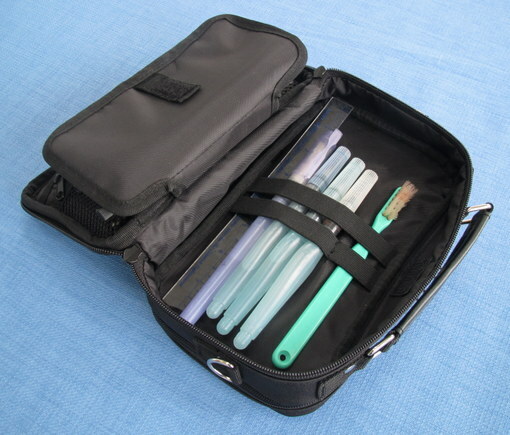 Check out this post for a look at the Kutsuwa Dr. Ion Super Mega Pencil Case that I plan to take on my trip. It's been a busy summer, hasn't it? I'm really not ready to say goodbye to warm days, big blue hyrdangea blossoms, and fresh veggies from the garden, but there's definitely a hint of autumn in the air and I have to say I love having four seasons to experience every year. 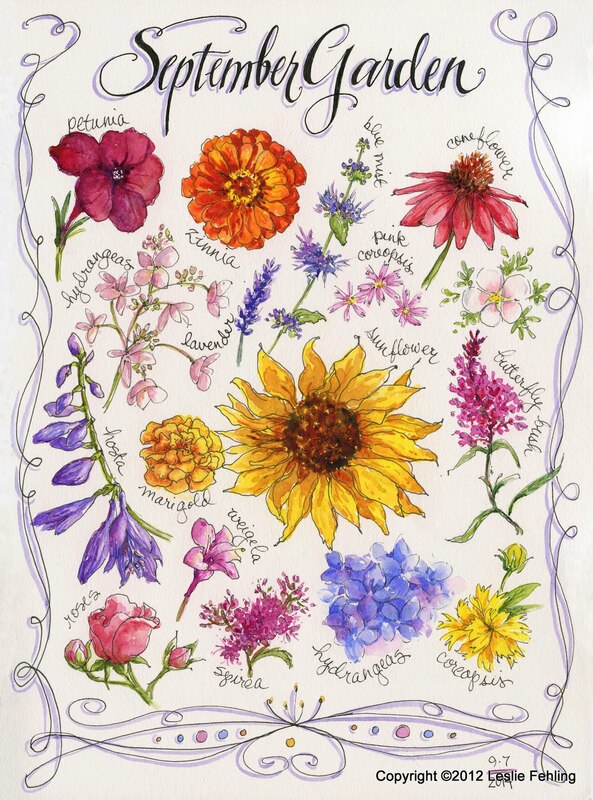 There's something wonderful to enjoy in each one. So bring it on, Fall! It shows the views in every direction from the beach in front of our condo. That's me and my husband, Fred, sitting in our ancient beach chairs, vegging out with a book (me) and taking a nap (Fred). 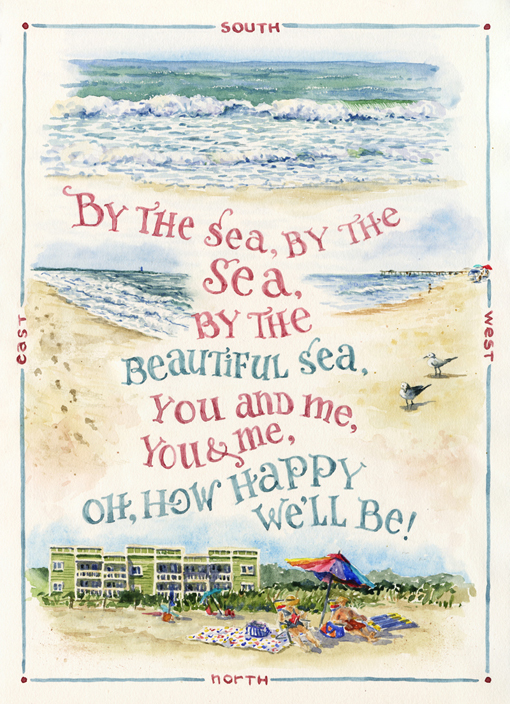 I painted the top three sketches and sketched the lettering in pencil while I was at the beach, sitting peacefully in the shade under our beach umbrella, with a soft breeze blowing and waves breaking on the shore. 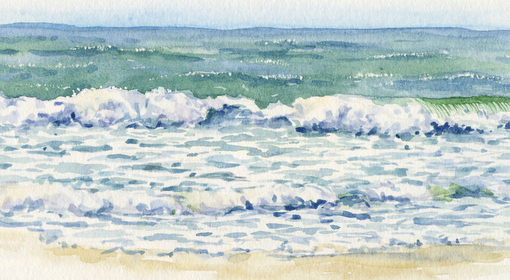 I finished the fourth sketch (the northern view) later at home in my studio, painting from a picture I had snapped that day at the beach. I painted the lettering, added a simple border, and it was done. 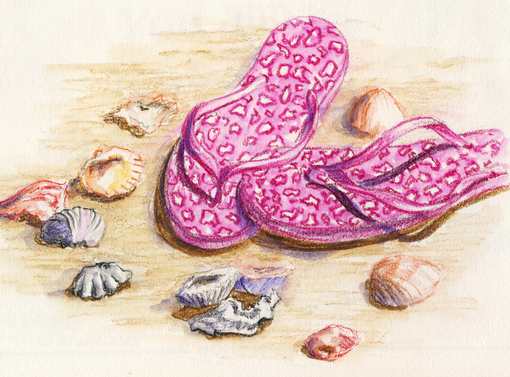 This has been a beachy summer for me. From Maine to southern California to North Carolina, I've enjoyed the special peace and happiness that comes from being near the ocean. Walking on the beach, wiggling my toes in the sand, sitting and watching the waves roll in.....at the beach there are no timetables, no expectations, no "shoulds". The only requirement is to be there...to be mentally present and take it all in. It's good for the soul. After two days of teaching, I had a day off today. I was up early since I can't seem to get my internal clock set to Pacific time. Patti had told me about a coffee shop up the street, so I quietly left the house at 5:30 am and found my way to Zebra House Coffee where I got a yummy pineapple-coconut gluten-free muffin and a piping hot mocha. They had six different GF muffins varieties to choose from -- amazing! I don't think I've ever found a GF muffin at a coffee shop in PA. Walking through the neighborhood was so much fun because the architecture, trees, and plants are so different from what we have at home. Its homeliness only adds to its cuteness, don't you think? 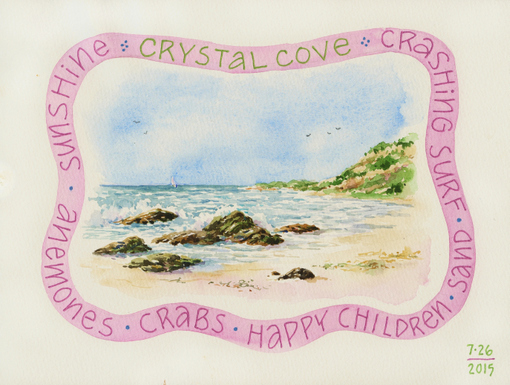 Around 10 am Patti and I headed up the coast to a pretty spot called Crystal Cove where we sketched a bit, explored the tide pools, and had a delicious picnic lunch. Sitting and watching the ocean, I'm perfectly content. 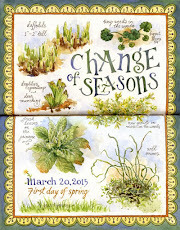 9-1/2" x 7" Canson sketchbook, pencil and watercolor. Lettering done with metallic gel pens. On our way home, we visited the Montage resort in Laguna Beach, where the public is allowed access to the beach and grounds. It was a beautiful place with gorgeous landscaping and views to die for. Even the public restrooms are beautiful! Just look at the color of that water! My day off yesterday was loads of fun (and I only got a little bit sunburnt!) but I was ready to get back to San Clemente Art Supply and meet my new students this morning. 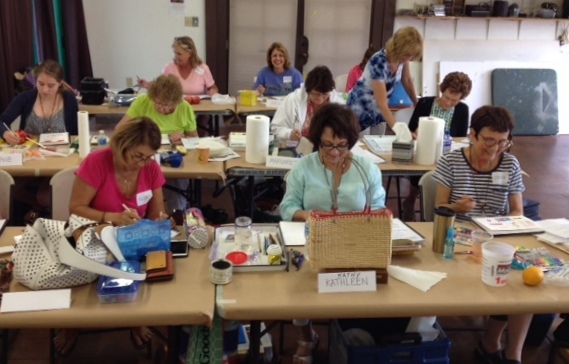 It's another full class, but that just makes it more fun. More creativity, more bouncing ideas off each other, more energy in the classroom. Even lunchtime was fun, sitting in the sunshine, chatting about our lives. Have you ever seen another art store with landscaping like this? 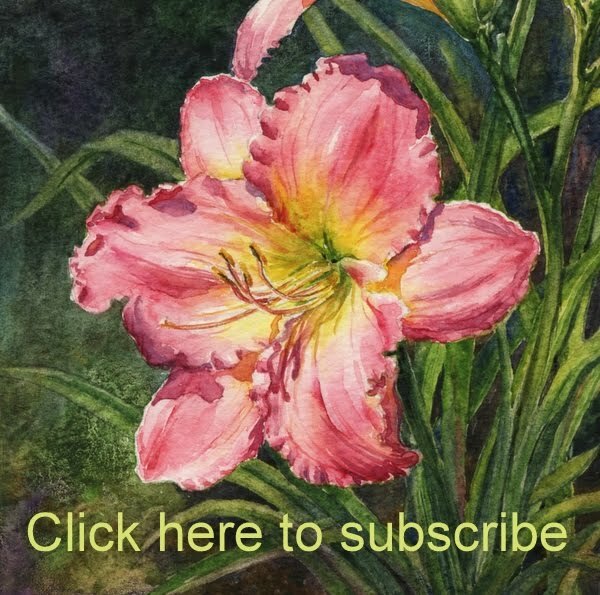 Patti and her husband, Richard, have created something special here. My last day in San Clemente! I have a great group of women in this class, They're so enthusiastic, and they dive right in to every project I assign. Sketching candy in 30 seconds, directly in pen? Some people would laugh in disbelief, but this group just laughed and did it! 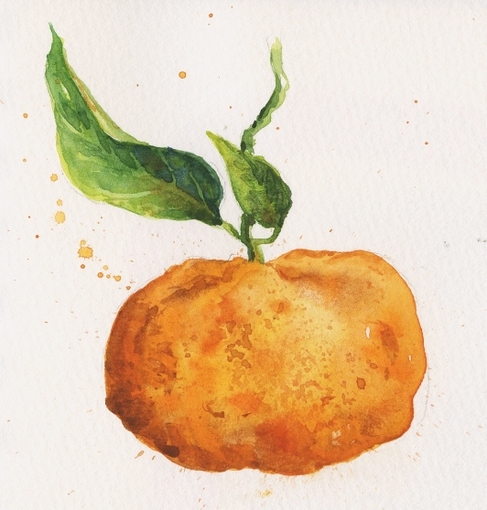 and their artwork ranged from sweet and funny to impressive and inspirational. Here they are - my super sketchers! It's a no-brainer! I'm going back to San Clemente! After I packed up my sketchbooks and made one more shopping trip through the art supply, I walked down to the beach one last time. I guess if you live here you might come to take it for granted, but since I live far inland, it's a thrill for me every time I see the ocean. I worked hard in California but was repaid many times over with wonderful students, warm and giving hosts, fantastic food, new friends, beautiful beaches, and a great big ocean thrown in for good measure.